Lunar Foundation is a registered non profit organisation from Ambernath. It is a group of youngsters who are either studying or just begun to work. We go around spreading Education to the underprivileged. 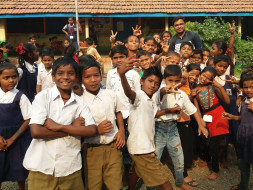 This year we managed to pay the school fees of 20 single parent/orphan children from various good schools in and around Ambernath, details of whom are given on our website (www.lunarfoundation.in). It was possible only because of our generous donors. Azharan's mother thought that her son would not be able to attend school. A poor family, they barely had ends to meet, let alone money to send their son to school. However, Azharan's dream of attending school came true when Lunar Foundation stepped up and paid his fees. Now, Azharan goes to school and dreams of completing his education. His mother is grateful that her son has the chance to complete his studies. Next year too, we would like to support the Education of many more children if you all are with us. So let's work together.